Kit Includes: A 12 piece stencil set along with 100 foot pre-spaced paint mask roll used in conjunction with stencils. All stencils are designed to line up with existing bodylines and color photos are included for an accurate stripe. 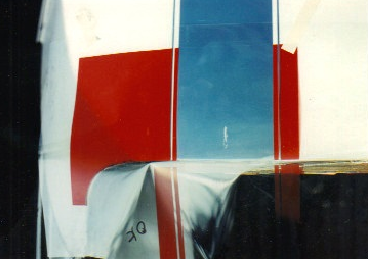 100 foot pre-spaced paint mask roll used to join the front hood, roof and trunk lid stencils. All stencils are designed to line up with existing body lines and color photos are included for an accurate stripe. Kit includes application squeegee, how too sheet, color photo’s to help in placement, and paint information. Left & Right Trans Am Fender & Spoiler name. Kit includes vinyl application squeegee, how too sheet, color photo’s to help in placement, and paint information. Note : This kit was created by us, working off an original car in 1995. All photos in this kit are of that Trans Am. 3 sets of prototypes were created to insure an accurate kit. While others may try to copy it this is the original and a complete kit offered with or without two Trans Am fender and one spoiler name and includes 12 individual stencils ready to use, not something that has to be cut off a sheet. The how to includes color photos of the original 1969 Trans Am used, of the hood, cowl panel, roof, rear deck, and trunk lid. Shown in the photo is one of the many templates we used to create the 1969 T/A kit. Great care was taken to insure an accurate paint stencil kit.